Imagine: your parent or loved one has been diagnosed with Parkinson’s disease, a common illness that affects more than 10 million people worldwide. Where do you start? In the United States, your primary care doctor may refer you to a movement disorders specialist. If you don’t live near a major city or teaching hospital, you may have to settle for a general neurologist. With over 16,000 neurologists in the country, expert advice and alternative treatment options are available, especially if you're willing to travel to seek additional opinions. Now imagine: You live in South Africa. 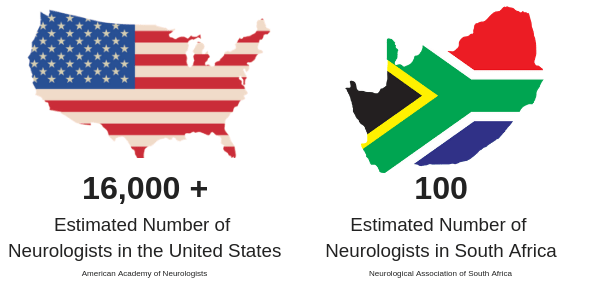 Your loved one receives the same diagnosis, but according to the Neurological Association of South Africa, there are only an estimated 100 active neurologists in the entire country. The prospect of finding a specialist to treat your loved one in the public sector now seems far less likely. You decide to seek treatments for your loved one as private patient, but the neurologists you meet are not willing to try alternative, research-based approaches. Unfortunately, this problem was all too real for Sam Miller and his family. When it came to getting the best treatment for his parents’ neurological illnesses, Sam and his family struggled to find the right doctors in their home country of South Africa. So Sam, together with UCLA’s Center for World Health and the South African Consulate, founded the Brenda Lucille Miller UCLA South African Education Fund, which provides opportunities for junior South African doctors and scientists focusing on neurological diseases to come to UCLA to engage in clinical studies. 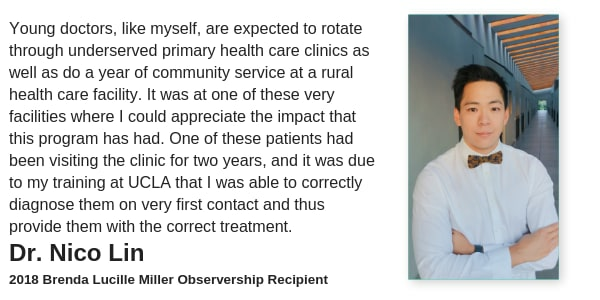 Two physicians have already completed the observership program and are making an impact on their patients back at home in South Africa. Now, with your support, UCLA will train a 3rd South African Neurologist. Donations to the Brenda Lucille Miller UCLA South African Education Fund is an investment in the future of Neurology. Your gifts, when combined with other advocates, will bring early career doctors to Los Angeles for two months to engage in postdoctoral studies. Working closely with UCLA faculty, participants will receive specialized neuroscience training in surgical, hospital, and outpatient settings, with the goal of applying this knowledge and skill set to improve the diagnosis, treatment, and management of neurologic diseases in South Africa. 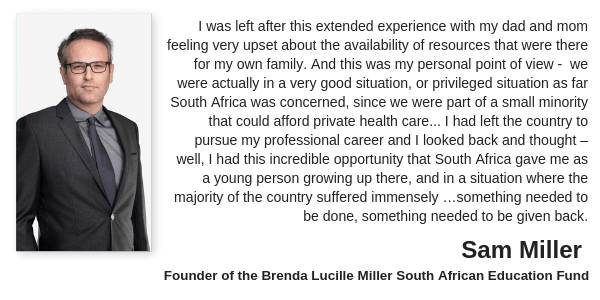 Existing support for the Brenda Lucille Miller UCLA South African Education Fund has already made a difference in the lives of South African physicians and the patients they serve. 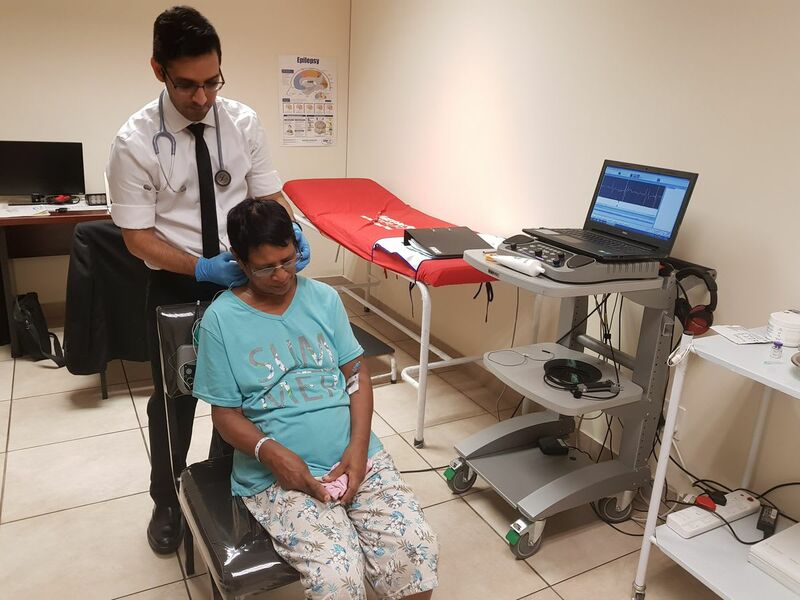 Since returning from his experience learning from UCLA researchers and physicians, Dr. Naazim Siddi Ganie now serves as a movement disorder neurologist at 4 hospitals in RSA: Life Mount Edgecomb Hospital, Netcare Alberlito Hospital, The Bay Hospital Richards Bay, and Melomed Hospital Empangeni. Dr. Nico Lin sees patients at the Charlotte Maxeke Johannesburg Academic Hospital. Your gift will benefit not only South Africa but the entire African continent, as South Africa will become a clinical leader in these diseases for the entire region. By supporting the post-doctoral training of these South African physicians, you will help expose them to US research and treatments and provide them with ongoing mentorship from UCLA physicians. The UCLA Global Health Education and Research Program, formerly known as the Center for World Health, has a vision to heal humankind through shared knowledge and compassion, and to make a difference in people’s lives throughout the world. Our mission is to improve the health of people and communities around the world through education, research, and service, and to guide the next generation of leaders to use their vision, talent, and commitment to transform the practice of world health to make a sustainable difference.